Reining in inflation in India remained on top of the Reserve Bank of India’s (RBI) agenda last week when it reviewed key interest rates and kept them unchanged. The RBI’s hawkish stand once again dashed the demand of industry and India Inc., to move towards a liberal monetary policy and cleared the air that the monetary policy regulator won’t budge an inch until it reins in consumer price inflation to 6% or below by January 2016. In fact, the RBI governor Raghuram Rajan clearly said that upside risk to the target remain intact and leave no scope for the regulator to give in to banking industry wide demand of cutting down on interest rates. The RBI’s hard stance has once again raised the debate whether monetary policy alone can tame the country’s inflation when a lot of it comes from structural problems in the Indian economy, particularly on the supply front. Inflation, defined as a sustained rise in the prices of commodities leading to a fall in the purchasing power of a nation, is part and parcel of an economy. However, any abnormal increase in inflation above a predetermined level raises is a cause for concern as persistent levels of high inflation erodes economic performance. In general, inflation can be attributed to a single or combination of factors such as excess monetary liquidity, a rise in input costs, volatile exchange rates, increased taxes or war costs. Broadly, they will fit either into the Supply-Demand theory or Cost Push theory. The former can simply be described as too much money chasing too few goods while the latter suggests that inflation in India emanates from rising input costs in production which then are passed on to consumers. In India’s case, both frameworks apply and explain the cause of inflation in India. First things first, the current spate of inflation in India, particularly food inflation, which has hovered above double digit figures until not so recently, requires a tight grip on money supply at least in the immediate to short-term. The RBI’s stand is, therefore, understandable. To dub it as an unnecessary reaction is wrong as India has no control over external factors such as oil prices, sluggish global economic recovery, and ever-rising food prices, which may cause an overnight change in market sentiments. Although crude prices have fallen in international markets in recent months, India’s dependence on the Gulf will remain a factor and make us vulnerable to any volatility in oil markets. Post-2000, there has been a general increase in the prices of food grains across the world due to rising population and incomes. In turn, the production of food grains has not kept pace with the demand. In India’s case, the high level of social spending under the MNREGA increased incomes in the rural areas and spurred demand in food grains and other items. A sluggish economic recovery in the United States and Europe and slowing down China has also deterred investors to take risks. While stock markets have improved remarkably in last two quarters, the fundamentals of the economy remain weak and susceptible to these factors. 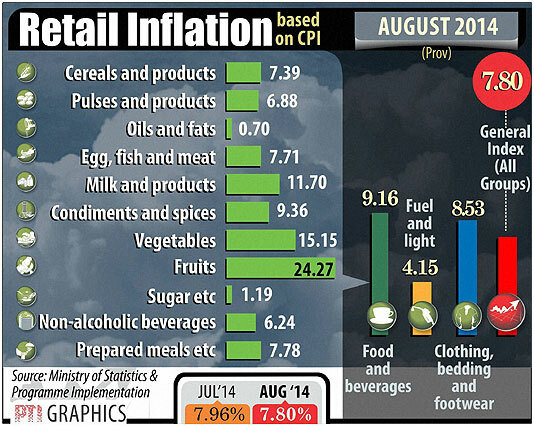 The RBI is playing its part perfectly in the war against inflation. However, there is a huge scope for the government and policymakers to intervene. There is a general agreement among economists that the country requires next level of economic reforms to unleash a supply-side revolution. It requires a massive spending in infrastructure development such as building of roads, airports, and rail network, and modernizing the already existing structures. Likewise, investment is required in irrigation, water and power supply, modernization of agriculture, and education sector to prepare the population to cater to the needs of a developing economy. A lot of emphasis has to be put in skill development instead of rote learning process, which currently signifies the present education system in India. The country alone cannot meet the investment required to finance these long-term projects. India can bank upon foreign investments and expertise including technology transfer to meet these requirements. Next two years are important from India’s perspective. It will have to make adjustments on both monetary and economic front to initiate next cycle of investment and growth. The political class will have to rise above ideological differences and take measures to improve economic profile of the country.